Made by Walther and very affordable ! Awesome gun, awesome price, fast shipping ! Awesome gun, awesome price ! If you're looking for a 1911 rimfire clone, this is it. Already threaded for a suppressor, too. Walther did a nice job with this pistol and it's perfect for it's intended use (introducing new shooters to pistols in anticipation of moving to bigger 1911 cartridges later). Feels exactly like my .45ACP Colt Government model, only slightly lighter. Reliable... not a single failure to feed once we figured out what the pistol liked to shoot (Federal Auto Match). Reasonably accurate. And Grabagun's delivery was fast - was at my FFL in 3 days! Nice working gun, easy to break down to clean..
got an email from grab a gun that the sig1911 .22 was on sale for about 280. Thought what's the actual colt going for. Turns out about 40 bucks more. Rather have the colt 1911. Drag?! One clip. The Colt Government 1911 A1 Pistol 22LR completely met my expectations. Great product and a great experience with the purchase from GrabAGun. The Colt Government 1911 A1 is the classic configuration of the legendary Colt 1911 handgun carried by U.S. troops in several wars. The Colt Government 1911 A1 Semi-Automatic Pistol in .22 L.R. is manufactured exclusively by Walther under license from Colt. It is the only genuine Colt tactical rimfire replica available in the world. 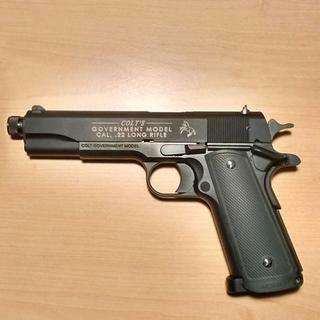 The Colt Government 1911 A1 Pistol 22LR 12 15-inch is a classic semi-automatic weapon. It is the gun Government troops have used in several wars due to its easy of use and durability. This handgun is exclusively manufactured by Walther under a Colt license. It is considered the only genuine replica of Colt Tactical Rimfire available. It has a threaded muzzle. It also accepts aftermarket accessories. It is all steel lock work with rubber grips for safer handling, as well as fully functioning thumb and grip safeties. It is a .22 long rifle caliber with a magazine capacity of 12-10 rounds. The barrel length is 5 inches as is standard on Colt Firearms 1911 models. The trigger is single action requiring 5 pounds of pressure and with a blowback operation.